NOVOBAKHMUTIVKA, Ukraine -- Three bridges on key roads leading into Ukrainian city of Donetsk were blown up Monday - an apparent attempt to slow down any possible assault by government forces on the rebel-held stronghold. People walk under a destroyed railroad bridge over a main road leading into the east Ukraine city of Donetsk, near the village of Novobakhmutivka, 20 km North from the city of Donetsk, eastern Ukraine Monday, July 7, 2014. The bridge has been destroyed, blocking a key access route to the rebel-held city. Separatist Russian fighters driven out of Slavyansk and other eastern towns by the Ukrainian army over the weekend had regrouped in Donetsk, a city of 1 million where pro-Russia rebels have declared independence as the Donetsk People's Republic. Pavel Gubarev, the region's self-described governor, had promised "real partisan war around the whole perimeter of Donetsk" before thousands of supporters at a rally Sunday. It was not exactly clear who blew up the highway and train bridges Monday, but their destruction would most benefit the rebels. Battles between Ukrainian forces and pro-Russia separatists have left over 400 people dead and thousands homeless since they began in early April. In the village of Novobakhmutivka, where a rail line crosses over a highway out of Donetsk, an 11-wagon cargo train was perched perilously Monday on the collapsed bridge. The road leads toward Slavyansk, a former insurgent stronghold that was recaptured Saturday by Ukrainian troops. Downing the bridge also damaged the rail line. Anatoly Krasov, who was driving along the road Monday, said he saw an explosion before the bridge collapsed with a large cargo train on it. He said a group of men dressed in the camouflage uniforms often worn by the rebels then got into their cars and drove back toward Donetsk. 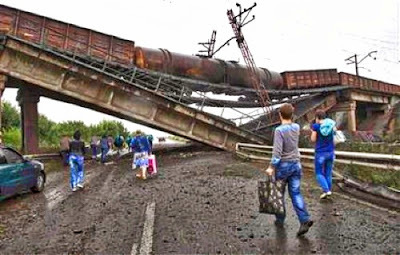 Two other bridges on roads leading from Slavyansk to Donetsk were also destroyed Monday in the villages of Zakitne and Seleznevka, the Road Transportation Agency of Donetsk Region said. The insurgents control the regional administration building in Donetsk and checkpoints on the city's outskirts. They also face little internal resistance from police forces or government officials in the city, who have done nothing in recent months to hinder their free movement around Donetsk. But it is unclear whether they will be able to put up major resistance in the face of a Ukrainian military attack. Ukrainian forces demonstrated their superior firepower in repelling a rebel attempt to take control of Donetsk Airport in May, a battle that killed dozens of rebel fighters. Many residents have fled the city and the streets are often deserted but for the rebels. Still, experts say that capturing Donetsk would be much more difficult than retaking Slavyansk, a city ten times smaller, and it could require the type of street-to-street urban warfare that would favor the rebels, not government troops. There was no word Monday from Ukrainian President Petro Poroshenko, who had promised to start negotiations on a new cease-fire last week. A contact group for the Organization for Security and Co-operation in Europe met in Kiev on Sunday to discuss the situation in Donetsk, but no representatives from the rebels attended and no breakthroughs were announced. On a trip to Bulgaria, Russian Foreign Minister Sergey Lavrov pressed again for a new cease-fire in Ukraine. He also condemned the OSCE for its "unrealistic demand" that the talks take place in Kiev, the capital, rather than in Donetsk. Putin has so far resisted demands at home and by the rebels to come to their aid, wary of having more Western sanctions slapped on Russia. On Monday, Russia's Foreign Ministry made its first statement about Slavyansk since the city fell. It tiptoed around the rebels' defeat, only mentioning Slavyansk as part of a long list of civilian casualties. Russia also urged the European Union to put new pressure on Ukraine, which it accused of waging a "massive military operation which has resulted in the deaths of peaceful people." Quote: "Министр иностранных дел Германии Франк-Вальтер Штайнмайер призвал власть Украины сесть за стол переговоров с членами незаконных вооруженных формирований для мирного урегулирования конфликта на востоке Украины, невзирая на последние успехи АТО. Как сообщили в пресс-службе МИД ФРГ, об этом Штайнмайер заявил во время визита в Монголию. «Даже если ситуация на востоке Украины изменилась в пользу украинских силовиков, то здесь не будет исключительно военного разрешения конфликта. Тем более, что большинство членов НВФ теперь засели в самом Донецке», - сказал Штайнмайер, сообщает «УНИАН». Он напомнил, что 6 июля в Киеве состоялась встреча контактной группы для разрешения конфликта на Донбассе, и назвал переговоры тяжелыми. «Все стороны поддержали декларацию, принятую 2 июля в Берлине, что означает продолжение разговоров, в том числе с представителями НВФ, для того, чтобы достичь общей цели, а именно - прекращения огня на востоке Украины», - сказал немецкий министр." Above you can read calls for negotiations, by German minister, in the "Donbass" region. German Government being bombarded by very strong lobbyists, of various kind, those lobbyists represents in majority industrial complex of Germany, some of them own majority of Northern Stream (Oil pipeline) so, the time for their calls for negotiations with pro-Russian bandits could off been influenced. No body wants war especially people in Ukraine but, it is essential to remove the "cancer sells" as completely as it is possible so, they never return.